A brass tube that acts as both the system's exhaust and stand, is screwed into a brass and lead base engraved with "Griffin, London". A brass T tube fits into the top of the stand, into which two glass L tubes fit into either arm. Two identical glass cylinders, each closed at one end by a silver thimble, are attached to the L tubes by cork stoppers, one of which has three holes (broken) the other two. One of the thimbles is filled with ether (an organic compound with a lower evaporation temperature than water) and its connecting glass cylinder is stopped with the three holed cork. A thermometer and a glass inlet tube both fit through the cork and end in the ether. Into the other cylinder, a second thermometer (missing) is also fitted. Finally, an aspirator or suction bulb (missing) is attached to the stand and air is drawn through the system; initially passing through the ether. 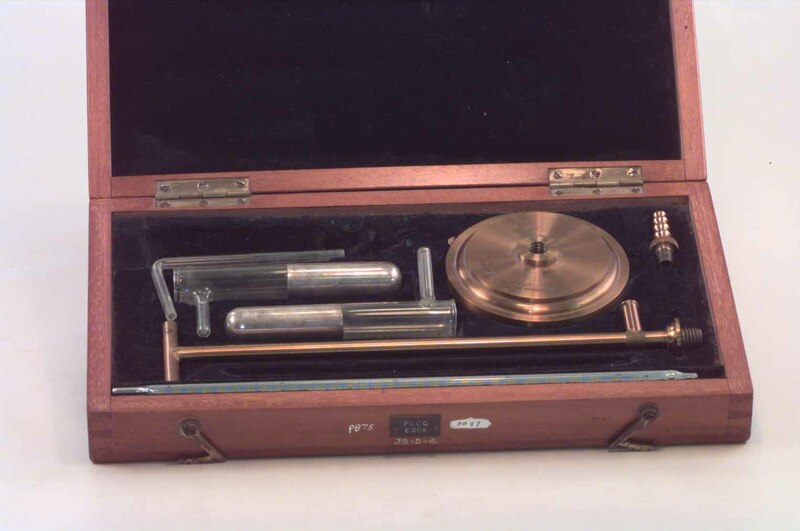 Before any air is drawn through the system, it is allowed to reach an equilibrium point, at which the atmosphere within the hygrometer is saturated with ether vapor. A small amount of fresh air is then passed through the ether and into the system, while the same amount of saturated air is expelled. This allows for further evaporation of ether and a consequent cooling of the full thimble. The action of the air bubbles in ether serves a twofold purpose in stirring the ether, facilitating more even heat distribution and conduction into the thimble and expediting evaporation. The temperature of the ether (and hence thimble) at which dew is formed can be measured and compared to the air temperature measured by the other thermometer. 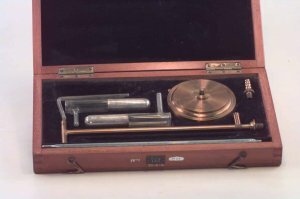 As described above, the apparatus functions as a device which is capable of gradually lowering the temperature of a polished surface whilst measuring its temperature. The point at which dew is formed, the dew point, is easily recognizable on the silver, as it suddenly dulls, and this can be referred to in tables which indicate the humidity corresponding to particular dew points at different temperatures. Actually measurements are made of the first appearance of dew, and then its disappearance as the temperature is allowed to rise again, and the results averaged. Originally, a telescope was also supplied (now missing), as it is necessary to read the thermometers from a distance of about ten meters. This is due to the fact that the average person emits about 63 grams of water per hour. Considering that only five grams are required to saturate a cubic meter of air at zero degrees Celsius such a precaution seems warranted.